A year ago I bought a license for the CASC concentration calculator. A great piece of software, there is hardly a day without using it! What are molarity, molality and density of 12.5% w/w sulphuric acid? Read density and other concentrations. Concentration calculator is used for both concentration conversions and concentration calculations. Start it by using tool bar or View menu. Click on the substance button to open the database window. 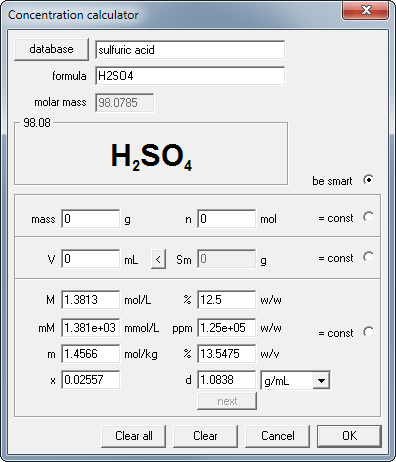 Select sulfuric acid from the list and click on Use button. Enter 12.5 into the mass percentage edit field and watch all other concentration fields changing their values. Ready! The lower part of the dialog window contains the answers to all questions asked. Solution molarity is 1.38, molality 1.46 mol/kg and density is 1.08 g/mL. Note that the concentration conversion will look the same regardless of which value you enter. In every case, all other concentrations are calculated by the program on the fly. 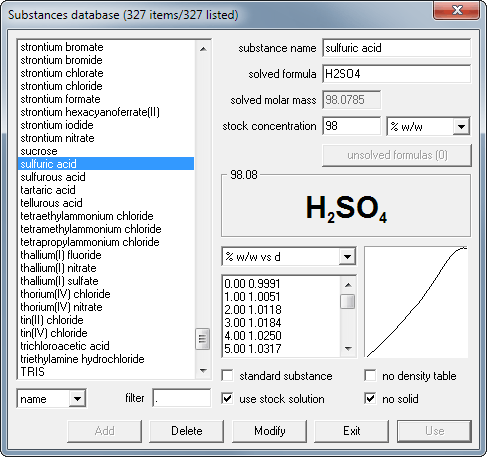 Conversions between concentration and density are done automatically for the substances with density tables present in database. If there is no density table, conversions are done assuming density of 1 g/mL or using entered value. The calculator is very flexible - for three values describing the solution (amount of substance, amount of solution - by mass or volume, concentration) it will calculate any unknown value if two other values are given. Select other examples to check how to prepare solution using CASC recipe and how to calculate concentration of mixture of two solutions. You will find even more examples in the tutorial being part of the help distributed with the CASC and available in both registered and trial version. quick jump: pH calculator, concentration calculator, stoichiometry calculator, buffer calculator, chemical calculator suite, pH calculation, concentration calculation, stoichiometric calculation.